Varicoceles are abnormally dilated veins of the pampiniform plexus in the scrotum, usually secondary to internal spermatic vein reflux. Virtually unknown in children, varicoceles are detected with increasing incidence in males between the ages of 10 and 14 years . The incidence of varicoceles in the general population is approximately 15% . The incidence in men with primary infertility however, is 35% to 40% , and in men with secondary infertility it is 70% to 80% . This suggests that, although most men with varicoceles are fertile, varicoceles can cause a progressive decline in fertility. Varicoceles are more common on the left side, and the incidence of bilateral varicoceles is 30% to 50% . 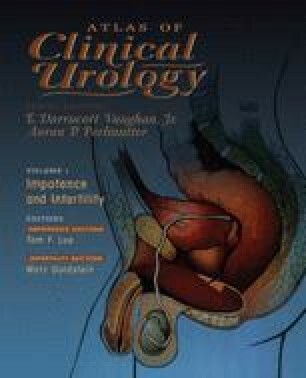 An isolated right-sided varicocele is uncommon and raises the suspicion of retroperitoneal pathology.